Italian yacht builder Benetti has launched three superyachts from its Custom line. 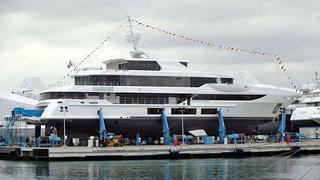 Most recently, Benetti launched 56 metre Surpina. Her striking exterior styling is dictated by the owner’s layout requirements, which called for enclosed stern areas on the main and upper decks. This sets her apart from other Benetti yachts and gives a different profile. The aft decks are surrounded by large windows, which extend the main deck living area all the way aft, and on the upper deck, this space is set aside for a gym that’s adjacent to the owner’s suite stateroom. Surpina’s layout affords accommodations for 14 guests in seven staterooms. The interior is described as “classic Italian” with use of white carpet and marbles and elm root panelling with mahogany, walnut and rosewood detailing. The owner’s brief included antique period furnishings sourced from Italy. Twin MTU 12V 4,000 M53 engines provide a range of 5,000 nautical miles at a speed of 12 knots. Surpina will be delivered later this month. Prior to this launch, Benetti launched two other custom series yachts late last year, including the 50 metre Vica, sold in 2011, and 63.5 metre FB264. Unusually, Vica marries a fiberglass hull with an aluminium superstructure, which allows for greater client customisation thanks to the flexible nature of aluminium. The successor of the previous Benetti Vica, the new 50 metre hybrid yacht has a Mediterranean exterior styling with spacious decks for outdoor living. Vica will accommodate four guest cabins on the lower deck while the owner’s suite is found on the main deck forward and an additional stateroom is on the upper deck. She also accommodates 12 crew in six cabins. The interior is homely, with the lighting design used to bring a wow factor featuring an alabaster column lit from the inside with LEDs. Vica is set to deliver in the middle of March 2015. The largest of the new custom launches announced, FB264, is a 63.5 metre steel and aluminium yacht that is completely custom and design for private use by her owner. Aside from the main saloon, all of the living spaces are design to be small and intimate rather than expansive. Interesting materials abound, including a sharkskin headboard, metal inlays and transparent glass drawers. Benetti also launched hull FB255 60m superyacht Formosa in December 2014, and Benetti announced a 63 metre yacht to be built on spec.